Back in November the girls and I whizzed off to Disneyland Paris to attend the premier of Disney's newest animation, Wreck-It Ralph. The movie goes on full release this weekend and here's why we think it should be top of your half term 'To Do' list. Set in the 'behind the scenes' world of arcade game characters, Wreck-It Ralph is a clever, colourful, classic tale of underdog coming good that appeals to the whole family. Ralph (voiced by John C. Reilly) has been overshadowed by Fix-It Felix, Jr. (voiced by Jack McBrayer), the good-guy star of their game who always gets to save the day. Tired of playing the role of a bad guy, Ralph takes matters into his own massive hands and sets off on a journey across the arcade through multiple generations of video games to prove he’s got what it takes to be a hero. On his quest, Ralph meets tough-as-nails Sergeant Calhoun (voiced by Jane Lynch) from the first-personaction game Hero’s Duty, and feisty misfit Vanellope von Schweetz (voiced by Sarah Silverman) from the candy-coated cart-racing game Sugar Rush, who may just tun out to be Ralph's first real friend. But everything changes when a deadly enemy is unleashed, threatening the entire arcade. Of course, Ralph finally gets his chance to save the day—but can he do it in time? I love the way Wreck-It Ralph taps into the nostalgia of classic 8 bit arcade games from the 1970's and 80's and combines it with modern candy coated animation (Sugar Rush) and awesome first-person shooter animation (Hero's Duty) as Ralph game hops to save the day. I'm notorious for falling asleep in a darkened cinema, but Wreck-It Ralph had me chuckling and entertained from beginning to end. It's a feel good movie that's set to become a Disney classic. Word of warning though... when you get home, you may just be itching to dust down that old Commodore 64 and indulge in a spot of gaming, old skool stylie! 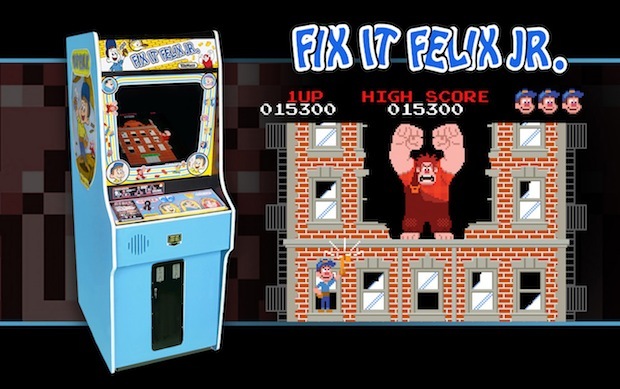 Ralph in his own 8Bit Game - Fix It Felix JR.
Wreck-It Ralph crashes onto the big screen on February 8, 2013. You can see it in Disney Digital 3D™ in select cinemas. No prizes for guessing what we'll be up to this weekend! The girls are desperate to see it again. Check out the official Wreck-It Ralph website at www.disney.co.uk/wreck-it-ralph there are some cool games you can download (just incase you got rid of your C64 years ago! ).